Three-dimentional designed snowflake that will make a magnificent addition to your Christmas tree. Its style and colour will coordinate with virtually any holiday decor. 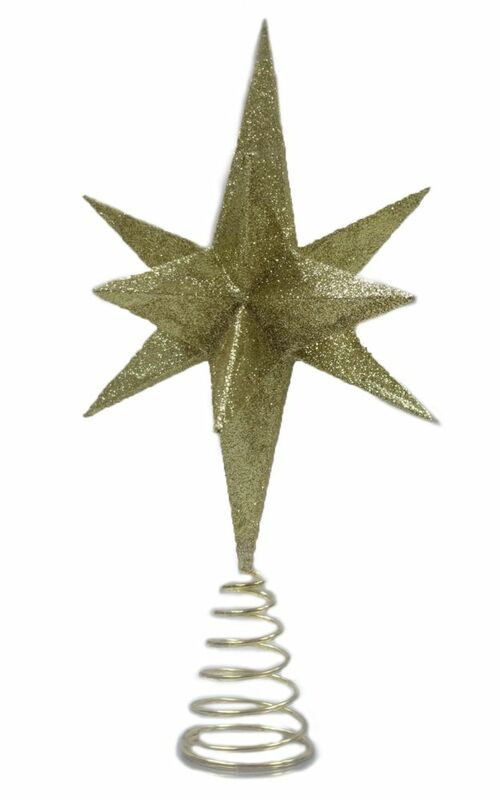 Top of your favorite Christmas Tree with this beautiful Star Tree Topper. Made with durable clear plastic and finished with a light glitter covering. Add to that 11 CUL approved lights for a sparkling Tree topper. Easy to install and care for. Includes 60in Lead In power cord. Add to your Christmas decor this holiday with this 20 in. Assorted Decorative Spray. Featuring glitter, pine cones, berries, blooms and evergreen branch tips, this spray can be shaped to fit your decorating needs. Add these decorative elements to your Christmas tree, wreath, garland or tabletop decor. 14-inch Gold Shatter-Resistant Christmas Tree Topper Three-dimentional designed snowflake that will make a magnificent addition to your Christmas tree. Its style and colour will coordinate with virtually any holiday decor.